Believe me, I would love to be proven wrong as to Obama and the admittedly more subjective disagreements I have with him in subjects such as Economics and International Issues (I do not find ANY common ground when it comes to more objective issues such as his voting against the "born alive Amendment" in Illinois and similar moral issues). I do think it is only right for me and others who disagree with him in the 'arena' of Economics and World Affairs to give him a chance, maybe just maybe he will prove me and others wrong (not likely though). *My first worry is that the Stock Market and even MUCH more so the Paper Commodities Market are indicators of where experts project business in the future and with recycled paper prices off more than 50% since Obama's election this doe not bode well (paper is necessary for shipping and many aspects of commerce, so when demand is off this much, business show little faith in the economy rebounding anytime soon). *Next, is the media which is so out of touch with reality it is mind boggling. From the totally mind numbed George Stephanopolis, Oprah Winfrey, to so many others in the media. Their behavior, actions, and support affects the views of "followers", especially those that will not do ANY research of their own and just "lap up" the "Kool Aid" of star mania or outright lies and half truths from these so called "objective journalists. Even off the subject of Obama, the media tried to play up a suicide of a Paula Abdul fan as reaction to rejection from American Idol, when in reality MAYBE if the media had was not so star struck, making stars to be "gods" this would have never happened (such as how Oprah and others treat the False Messiah; Obama). *My next concern honestly does not directly concern Obama, but does concern me are some of his most ardent supporters (to whom he is likely to listen and HAS listened to in the past). What is interesting here is that although Obama won "fair and square" as best I can tell, you do not hear most conservatives protesting or demanding his election be over turned for whatever reason, YET in this same election proposition 8 won in liberal California and the screams and demands for the over turn of this vote by the PEOPLE of California is sickening. Along this same line you have AIG, one of the most liberal big government supporting pig corporations out there getting more than one bail out and continuing to flaunt their arrogance (as most liberals do) in the public eye, yet the Media (due to their lack of morals IMO) totally misses the roots of the problems and who AIG truly supports. "To judge by the rhetoric coming from Capitol Hill liberals, you would think the recently bailed-out American International Group (AIG) was some sort of free-market, government-hating, leave-me-alone-to-make-my-profits capitalist cowboy before it came begging this week for a handout from Uncle Sam. The company’s lobbying record and campaign contributions tell a different story. AIG has built its business in conjunction with big government and, naturally, lobbied for big government programs that make some of its businesses possible. Still Democrats are using the company’s collapse, and the broader context of the financial crisis, as an indictment of the free-market and of Republicans. Senate Majority Leader Harry Reid (D-Nev.) summed up the Democratic line of attack Tuesday: “in their simplistic philosophy of big business equals good, government equals bad, the administration and Republican Congress let the financial sector go wild.” To accurately cast AIG’s philosophy in similar terms, Reid could put it: AIG equals good, government equals good." *My next concern is the associations that Obama CURRENTLY surrounds himself or have backed him, in the PRESENT (not past associations). We can start with his Chief of Staff; Rahm Emanuel who is little more than a gang banging thug. 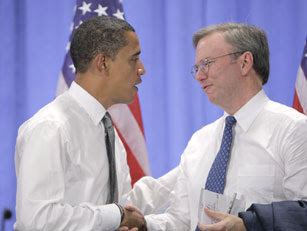 Then we have his cozyness with possible appointment of Google CEO Eric Schmidt (a true sleeze bag when it comes to lack of business ethics IMHO), whose company is probably the closest rival to Obama in a Messiah-like grip on the general public (if not more so). Google has been one of the largest contributors to far left causes, but worse than that is again its grip on the public in a God like status despite the FACT they are one of the most dishonest large corporations in America, and unlike other companies that practice less than moral business practices in the open against other large companies that can afford lawyers, Google practices their corporate stealing and dishonesty behind closed doors, mostly against the smallest of business. Professor Olson adds: “In aggregate, the map of the territory Republican won was mostly the land owned by the taxpaying citizens of this great country. Democrat territory mostly encompassed those citizens living in government-owned tenements and living off various forms of government welfare…” Olson believes the United States is now somewhere between the “complacency and apathy” phase of Professor Tyler’s definition of democracy, with some forty percent of the nation’s population already having reached the “governmental dependency” phase. If you are in favor of seeing the end to our country as we know it, then by all means, delete this message. If you are not, then pass this along to help everyone realize just how much is at stake, knowing that apathy is the greatest danger to our freedom.